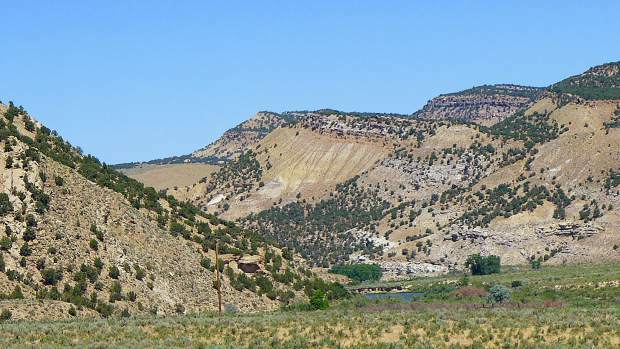 A view of the White River valley 23 miles east of Rangely, with the Wolf Creek drainage, to the left, open above the White River, flowing westward. The telephone pole, foreground left, indicates approximately where the potential White River Dam would be located across the White River valley. “It’s a big bucket,” Jamieson said. That reservoir was built in 1984 to hold 13,800 acre-feet of water, but it’s gradually silting in, as expected. The surface area still “available for recreation,” or boating, is now less than 335 acres, down from 650 acres when the reservoir opened. Aspen Journalism is covering water and rivers in collaboration with The Aspen Times. More at http://www.aspenjournalism.org.